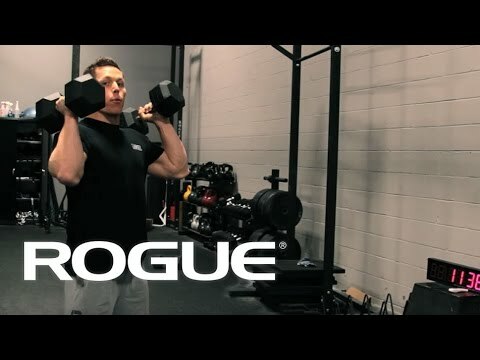 Rogue Dumbbells are sold in pairs and available in weights ranging from 2.5LB up to 65LB. This standard rubber hex design is a great, budget-priced option that still delivers on quality, performance, and longevity. The heavy-duty, rubber-encased heads minimize noise and limit wear and tear (to both the bells and your flooring), while the chrome-plated handle is ergonomically designed for a firm but comfortable feel in any grip style. All smaller Rogue Dumbbells up to 10 LB feature a 25mm diameter handle, while those 12.5 LB and up have a larger 35mm diameter handle. Dumbbell training has stood the test of time for good reason. Along with the versatility in weight choices for multiple athletes, a good set of bells can be used to duplicate nearly all types of barbell exercises, while also offering a wider range of single-arm, rehab-specific, and explosive movements in virtually any sized space—something not possible with bars or most weight room machines. Rogue Dumbbells is rated 4.9 out of 5 by 53. Rated 5 out of 5 by JCSlumlord from Good quality product at a affordable price I purchased a 55 lbs pair. My UPS delivery guy was NOT happy bringing my package to the door. The local place by me only carried up to 45 lbs. Given the quality of the Rogue product, I wish I bought earlier. Unlike the dumbbells I purchased previously, the Rogue ones have a nice rubber coating that makes them less abrasive on the floor when I put them down. The grip is also nicely designed, which is easier to grip than my other dumbbells. I will purchase more once I get strong enough to need a heavier pair. Rated 5 out of 5 by Rouge0311 from #1 Hex Dumbbells These are the best Hex dumbbells on the market and are priced reasonably. The handle is comfortable and the grip is average. Wish they would come out with a straight bar for Hex. Each dumbbell is individually packaged for better protection when shipping. Their is a little manufacture oil on the dumbbell which was easily wiped off. These Hex dumbbells are priced right and are perfect for a home gym. Rated 5 out of 5 by Brando from Not so Dumb I waited a year to review these just to see how they hold up. They still look like new I'm happy to say and I use them just about every workout with friends. The concave grip feels perfect in the hand and the hex shape keeps them in place as mine and most garages have a slight incline. I never throw my weights around so I don't know how they hold up to abuse but I do know that they will last me a lifetime. Rated 5 out of 5 by Twittens from Nicely built Fit and finish are excellent. The rubber is appreciated as these bounce off of various body parts during the exercises. I will be slowly buying heavier bells over time. Rated 5 out of 5 by Mad Money from Dumbbells Excellent very happy with the quality of these 50# dumbbells. Rated 5 out of 5 by Medocrat from Awesome Dumbbells Very high quality and beautiful looking dumbbells. Had greasy manufacturing residue which I washed off using a soft sponge and dishwashing detergent in my bathroom sink. Cleaned right off, although added a little bit of work. Unlike other rubber dumbbells, these don't have that strong noxious odor. In fact I could only smell them up close. This was a major buying concern for me as I have kids. I got the set between 10-30 pounds as it suits my current workout regimen. I will be buying more as my needs grow. Although these are not priced cheap, they are still similar in pricing to even lower quality rubber hexes on the market and still cheaper than many. They are soft, and I can drop them easily on the floors without risk of causing damage to either the floor or equipment. The knurl on the handles are just right, not too flat to cause slipping and not too rough to cause damage to my hands. I like how I don't have to adjust these unlike the cheaply constructed bowflex dumbbells. I looked forward to keeping these for a lifetime. Overall very pleased. Rated 5 out of 5 by DentistDude from Excellent. High quality. Worth it. Used to use power blocks. Didn’t know what I was missing until I got these bad boys. I hesitated to buy them for awhile because I couldn’t afford them but finally had to get them. Definitely worth it.